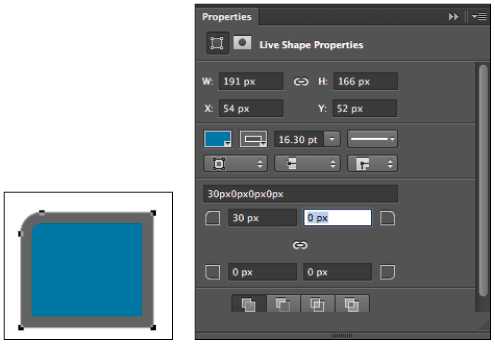 This tutorial provides you with a foundation for working with Adobe Photoshop Live Shape properties. It is the fourteenth lesson in the Adobe Photoshop CC Digital Classroom book. For more Adobe Photoshop training options, visit AGI’s Photoshop Classes. An outstanding new feature that will allow you to create more vector graphics in Photoshop is the new Live Shape Properties feature. Now, when you create a vector shape, the Properties panel reflects properties that you can change, such as the fill, stroke, stroke width, actual width and height, and more. A favorite will definitely be the ability to change the corner radius of a rounded rectangle, even after you have created it. You can also change the size of each individual corner radius by unchecking the link icon in the corner radius section of the Properties panel. In the Properties panels, you can more easily access the features that allow you to customize your shape by combining and subtracting shapes. You can now customize a The new Live Shape Properties feature. As you went through the lessons in this book, you used the Image size window quite frequently. You should know that the Photoshop team has added a new Edge-Preserving Upscaling Algorithm that improves sharpness and preserves detail when enlarging images. This includes a slider for reducing noise that results from detail enhancement. This does not mean that you shouldn’t try to use images that do not have to be scaled up in size; it means that if you have to, the results will be much better. 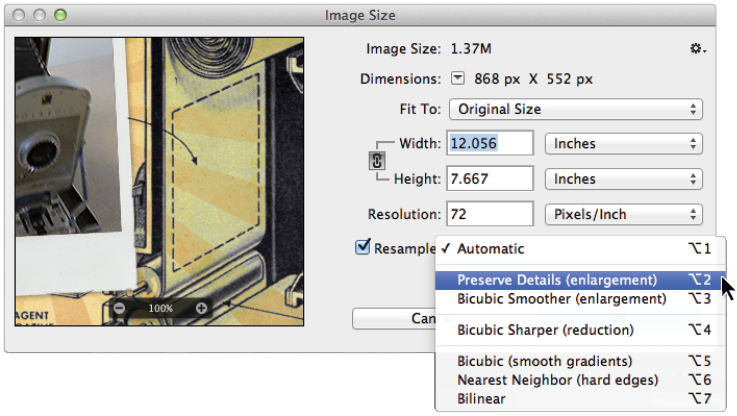 If you are scaling up in size, make sure to choose the resampling method called Preserve Details (enlargement). Improvements to help you scale images up in size have been added. If you have an online portfolio set up with Behance.com, you can now upload your creative work immediately to this website by selecting File > Share on Behance. This lesson introduced you to some of the new features; and all of them are included in this book. Many of the new features are built into the lesson files to help you discover how to apply them immediately. See available Photoshop Classes and learn from the expert instructors at American Graphics Institute. In-person classes at our locations, online courses, or private training is available. See our Photoshop Classes and learn from the expert instructors at American Graphics Institute in small classes or through private training.